It’s hard not to feel small underwater in Palau. Virtually every one of Palau’s signature dive sites are huge in scale, and for divers there’s the continual sense of flying around an underwater mountain range. 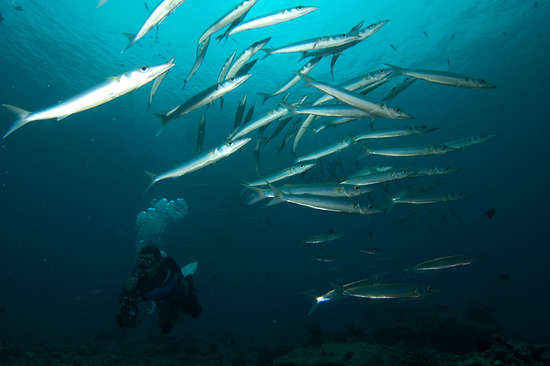 Wide aquatic plateaus drop off suddenly into the abyssal depths while scores of sharks implacably ride the currents along sheer walls; big schools of barracuda shine silver under the Palauan sun as they slowly drift into the blue. In short, diving in Palau can be summed up in one word: epic. This story previously appeared in EZ Dive magazine. Click any image below for larger versions. Palau’s vast underwater realm stands in stark contrast to its small place on the map above water. A tiny speck in the Pacific located a couple of hours flying south east of the Philippines, Palau’s remoteness has served it well as a haven for marine life. Recent government legislation has moved to preserve Palau’s unique status with the world’s first shark sanctuary being created in 2009. It’s the sheer number of sharks that can be seen at Blue Corner which makes it Palau’s most famous dive site, a horizontal finger of a plateau jutting out into the ocean and suddenly falling away with steep walls that seem bottomless. The visibility is often 40 metres plus and the strong currents that pass across the plateau mean divers usually need to hook on the rock at the plateau’s edge and then watch the action as grey reef, blacktip and whitetip sharks soar past, only a few metres away. Unhooking from the reef and tumbling back into the plateau itself, the current-blasted rock provides little coral to explore but a diver’s attention is usually grabbed by the great schools of barracuda that congregate cyclone-like in the plateau’s centre, glinting under the sun. 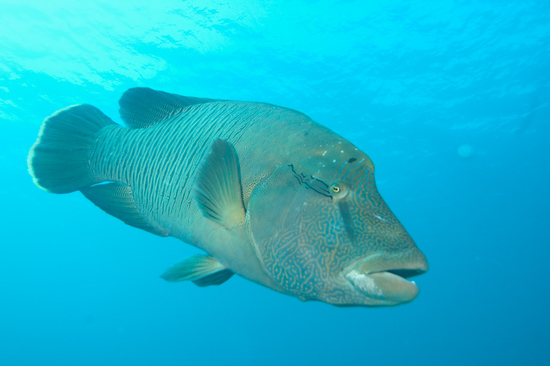 Amongst the sharks and barracuda, very large but still nervous napoleon wrasse are often spotted, shying away from attention despite their bulk. Blue Corner is just one of a string of must see Palau dive sites at Ngemelis island, only a few hours journey from the capital and main harbour of Koror. 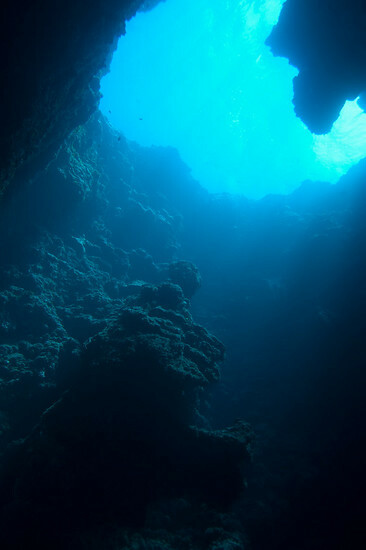 Blue Holes’ unimaginative name doesn’t really prepare the diver for the cathedral like grandeur of the four huge underwater chambers that have been carved out by nature here, magically lit up by the sun. 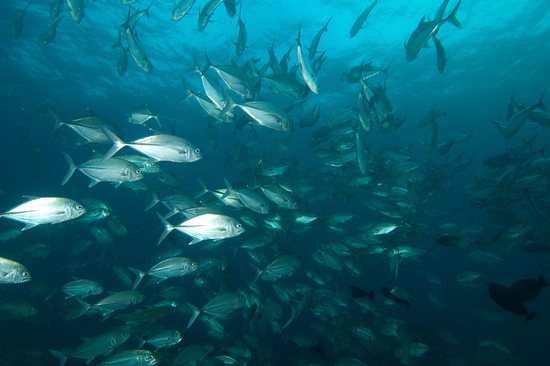 Similarly, New Drop Off turns out to be a fantastic complement to Blue Corner, with similar topography that brings close encounters not only with sharks, but dogtooth tuna and giant trevally too, as well as turtles casually munching what’s left of the dive site’s coral. Palau’s southern most point, the island of Peleliu, has its own unique cluster of dive sites. The scene of savage fighting during World War II, Peleliu today has a moving memorial and museum to honour the dead, as well as still surviving tanks and airplanes scattered around the island. Beneath the water, Peleliu Express and Peleliu Wall provide high-octane drift dives along gigantic walls where blacktips, whitetips and occasionally tiger sharks can be seen, as well as spotted eagle rays. The currents here can be fierce and provide the very definition of adrenaline diving. While Blue Corner continually grabs the headlines as Palau’s best dive site, there is an intriguing variety of other sites on offer too. German Channel has become famous for spectacular manta ray displays, and the shallow bommies in 15 metres where the mantas congregate for cleaning make an ideal warm up dive before tackling the more challenging wall sites. The Channel is actually a manmade construction, a straight waterway blasted out of the coral by German miners in the 1900s to allow easier access from the Philippine Sea to the Pacific Ocean. Over a kilometre long, manta rays are often spotted near the surface passing through the channel as well as at the cleaning station. During our couple of dives there we encountered a curious baby manta that followed us as we drifted from the cleaning station into the channel, playfully trailing and flicking its wings around us. Despite the obvious destruction caused nearly a century ago by the channel blasting, today there are some impressive coral bommies within German channel that provide alternative entertainment if the mantas are a no-show. Ulong Channel, often considered as a serious contender against Blue Corner for Palau’s best dive site, is a natural channel with strong, unpredictable currents that sends divers on an underwater rollercoaster ride over the reef, along the way encountering giant stingrays, snappers, sharks and the world’s largest lettuce coral. There is also a profusion of wrecks around Palau, the result of the World War II American bombing operation Desecrate One, which sent more than 60 Japanese warships to the bottom in 1944. One of the most popular of these to dive is Iro, an oil supply ship that lies upright in 20 metres of water nearby to Koror harbour. As the ship hoves into view descending the buoyline, the first thing that’s noticable is the sheer size of the fully intact gun mounted at the front of the Iro on a still clearly visible rotating base. 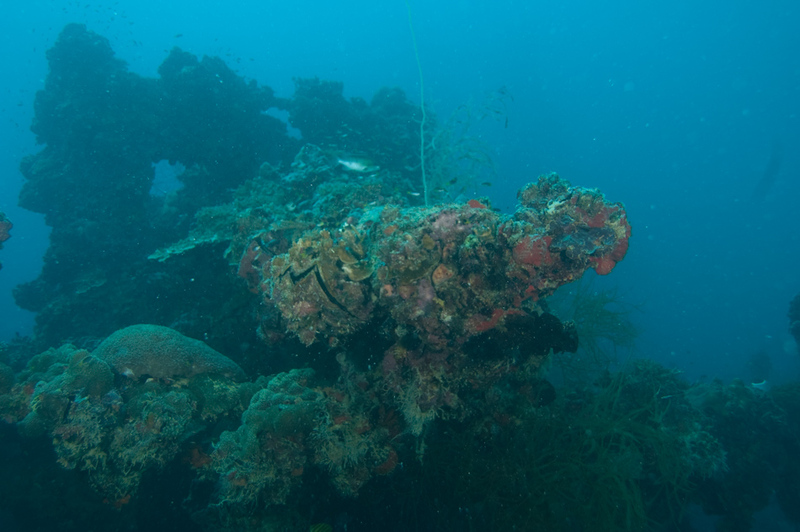 What was a weapon of war is now encrusted in hard corals and the entire ship has become a sanctuary for marine life. Another marine sanctuary, this time made by nature, is jellyfish lake, full of non-stinging jellies within an extinct volcano, a perfect place to visit on the last non-diving day of a Palau trip. For such a tiny country, Palau has a big place in the pantheon of great Asian diving. As the world’s shark population dwindles, it’s becoming one of the last places to see sharks in such numbers – here’s hoping that the recently established shark sanctuary succeeds and future generations of divers will also be able to experience Palau’s unique high adrenaline thrills. 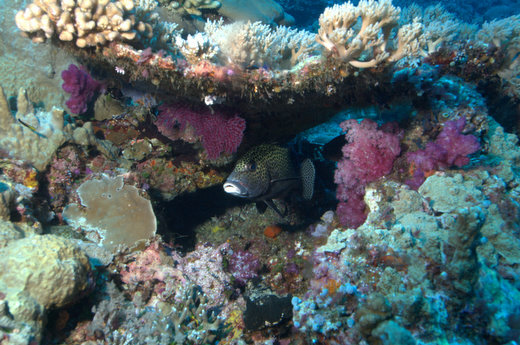 You can also read my previous trip report of diving in Palau in 2007. In terms of adrenalin and adventure, Palau is one of the best places I’ve dived in the world. Everything is BIG – the reef walls, the sharks, the sense of being in the wide open ocean. Here’s my notes from three days on Expedition Fleet’s new Palau liveaboard, Big Blue Explorer in June 2007. The Big Blue Explorer departs and returns to Koror, the capital of Palau. It is a great boat, bigger and somewhat more comfortable than other Expedition Fleet vessels I’ve been on, delivering good value for a three day liveaboard at around $US 1000. 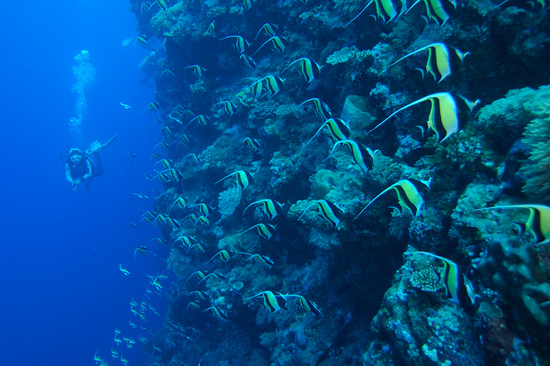 That includes up to five dives a day, including a night dive. We had a slightly different schedule as we were on a press trip. We had the option of four dives a day, although I skipped the night dives and I was subsquently told I hadn’t missed much. We only did two dives on the final, third day. It may seem a long way to go for only three days of diving, but believe me, Palau diving is just mindblowing – if you want to see big wall reefs, big pelagics and abundant corals, this is the place to go. One of Palau’s most famous sites due to a coral bommie on its reef being a manta ray cleaning station. The channel has a gently sloping sandy bottom with patches of reef – it keeps going on down past 30 metres. The main coral reef and the manta bommie is at 20 metres. After passing over the reef to the cleaning station bommie, the usual procedure is for the dive group to kneel on the sand near the bommie and stay still and wait and see if a manta ray will come in from the blue for cleaning. This leads to 10 or more divers grouped around the bommie at any one time. According to the dive guides, there’s a good chance of seeing mantas, but they don’t visit for weeks at a time, and then can return en masse – sighting of manta trains of up to four mantas moving in procession to the bommie have been reported. Did we get to see a manta ray? Not on the first dive. On the second visit to the German Channel at around 4.30pm, the viz had dropped off dramatically since the morning but there was definitely more activitity over the reef as dusk (and the need for dinner) set in. We headed back to the bommie and sat and waited patiently for 10 minutes or so. Nothing. Our group eventually decided to head back towards the boat, and had already strung itself out back over the reef a few metres away from the bommie when there was a frenzy of tank clanging. Out of the dusk gloom appeared a huge shape, moving implacably towards the bommie, the bright white of its underside clearly visible – it was a manta ray. It swept in around the bommie, effortlessly swerving around our cluster of divers, described a tight arc over the sand patch we’d been kneeling on a few minutes before and then swept back out into the blue, clearly finding the bommie a bit too crowded with overexcited, photosnapping divers. If we’d remained kneeling – and no one had moved – we might have been lucky enough to see the manta circle several times around the bommie and over our heads. Still, given that we’d almost missed it completely, the 30 seconds we’d got to spend with this manta ray was definitely good enough. While the mantas are undoubtedly the main reason divers come to this site, there is plenty of other life amongst the scattered corals – during the two dives we discovered a shark nursery at around 10 meters, with several baby sharks skimming around the reef, leaf fish and ghostpipe fish for the macro enthusiasts, plus a big shoal of barracuda and grey reef sharks hovering out in the blue. Four different coral chimneys lead down into this chamber that’s full of light and which leads back out onto the reef wall proper. It’s a dramatic and exhilarating beginning to a dive, descending down through the chimney into the blue light below. Emerging from the chimney’s bottom at around 20 metres, the wall of the reef stretches away in either direction and it’s vast in size – it feels like you need a widescreen camera to try and fit it in. A grey reef shark of impressive proportions came to investigate our group, fearlessly nosing in to within a few feet of us before imperiously sauntering back into the blue (and at which point I found my camera had jammed – gaaah!). 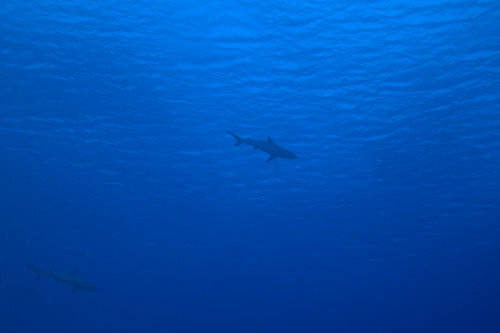 Several more sharks slowly patrolled above and below us, but kept their distance. Here’s Part Two of my trip report from three days glorious scuba diving in Palau in June 2007, on board the Big Blue Explorer liveaboard. If you want to start at the beginning of my Palau Scuba Diving Liveaboard, follow the link. Renown for strong currents as soon as you drop in. Shooting out across the reef plateau off the edge and then along, following with the outgoing current on a speed ride along the wall. The excellent visibility means that the huge drop of the wall is clearly visible, but there’s little time for gently taking in the scenery as the current pushes you along. At each corner of the wall, there’s a mix of currents smacking into each other which pulls you in several directions – not dangerous, but a little disconcerting and to be treated with care. When you see your own bubbles being dragged below you, it’s a good sign to excercise caution. Once past each corner the current reverts to following one direction. Plenty of sharks and small fish life to be seen along the way, and we also found a turtle wedged in behind a lump of rock happily having breakfast. Perhaps most famous as the home of the world’s largest lettuce coral, which is some 15 metres wide and 10 metres high, Ulong Channel has a mixture of landscapes underwater that makes it feel like going on an underwater safari in a single dive. Once onto the reef wall and following it with the current, there is a smattering of sharks to be seen as divers move towards the area where the wall becomes a sloping sandy reef. Here divers can use reef hooks to stay stationary and watch the sharks as they come in from the blue. After spending a while watching the sharks, the reef has an opening in the wall which turns into a channel at around 10 metres. This is where the huge lettuce coral is to be found, alongside lots more sharks. The current pushes divers along the channel quite rapidly – our dive was apparently pretty mild; our guide Sean told me that it’s been known for a dive group to get from the drop in point to the end of the channel within about 10 minutes on some occasions as the current can get superfast. For our group, it was fast enough to be fun but slow enough to be able to get some photos along the way, and it’s definitely a site that would be great to experience several times. Blue Corner provides a great vantage point for seeing sharks up close and personal from the plateau of rock at the top of its wall which catches the currents from both sides of the reef. After dropping into the blue, it’s straightforward to head down towards to the reef wall which drops away below and follow it along at around 20 metres to the shark viewing plateau. This is literally a flat rocky part on top of the wall – divers can use reef hooks here without damaging anything and then wait for the sharks to come cruising in from either side with the currents. Big grey reef sharks pass by right at the edge of the wall, a metre or so away from the hooked in divers, while curious napoleon wrasse move in between divers on the plateau itself. Behind the plateau the reef continues, with a sandy channel between the reef formations to explore at around 15 metres. The current gently pushes divers along the channel. 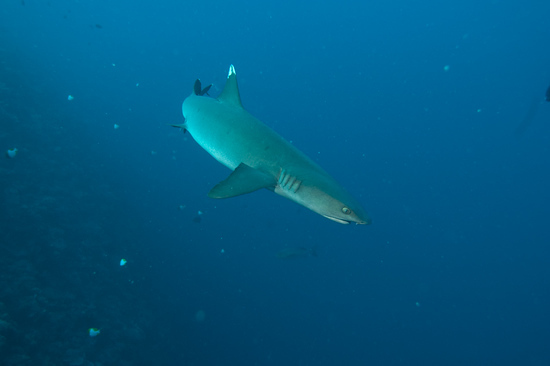 Reef sharks sit on the sand within the channel, clustered together and moving only when divers come within a few feet. A school of jacks pass overhead, and suddenly several more napoleon wrasse appear around the group, just after a fleeting appearance by a school of humphead parrotfish. It’s hard to know which way to look – some new species seems to arrive every minute. 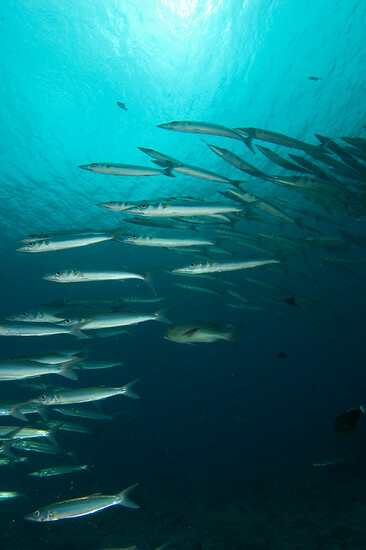 During our safety stop, we were pursued by the napoleon wrasse and as we drifted back out over the edge of the plateau into the blue, we could see a huge school of chevron barracuda beneath us. It was almost like the fish didn’t want us to leave. Blue Corner is the sort of dive you want to do again and again – there is so much to see it’s difficult to take it in, and coupled with the epic topography of the site – which is actually par for the course on virtually all Palau’s sites – it’s a truly glorious dive. The third and final part of my trip report about three days of scuba diving in Palau in June 2007 on board the Big Blue Explorer liveaboard. 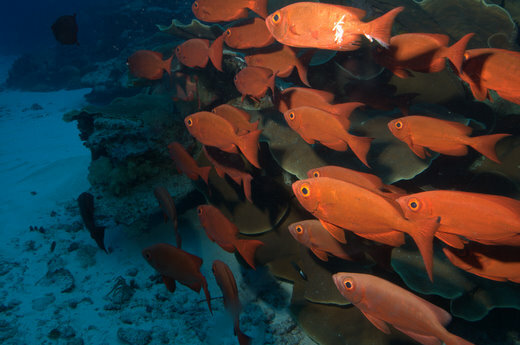 For Part One of this Palau Scuba Diving Liveaboard report, follow the link. Where the Philippines sea meets the Pacific Ocean, Peleliu Corner is also the meeting point of two big walls, both of which are diveable. We did Peleliu Corner itself, dropping in to the calm waters of the Philippines Sea and then following the wall out into the more frenetic Pacific Ocean. Unsurprisingly, the currents are very strong here – it’s easy to initially head down and align yourself with the wall, but after that you simply have to go with the current and enjoy the ride. 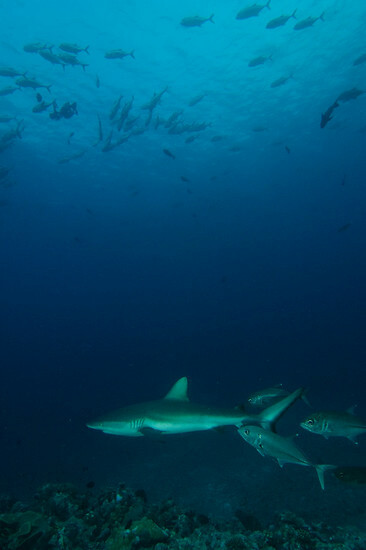 There are plenty of sharks riding the currents too out into the blue, and the clear viz lets you take in the vastness of the wall and the blue. There is a particular tricky bit along the wall called The Cut, where the wall has a fissure which causes a washing machine current – it’s important to follow your guide out into the blue to move around The Cut’s own mini current system and not get caught up in it. Not that it mattered too much – once we’d returned to the wall, the current was picking up stronger and stronger until we were swept further along the wall and then inescapably up over the plateau at around 15 metres, getting a fleeting glimpse of a spectacular marble ray as we did so. The plateau is quite barren but also an oasis of calm after the previous turbo trip – we had no place else to go but up after that, having covered our entire planned dive within 20 minutes flat. A few minutes of hanging in the blue brought us up into some fairly nasty swells within the ocean, which took a little effort both for the boat crew and divers to ensure everyone got back on board safely. Our final dive and a complete contrast to the previous dive. A coral garden on a gently sloping reef, the main claim to fame of Peleliu Pocket are several giant clams, which are over a metre in length. There’s plenty of tropical fish around here too, and some very aggressive triggerfish who will attack divers fins if they pass near the trigger nest. 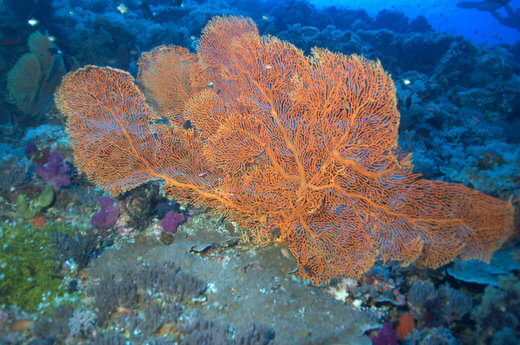 There are also some beautiful big fan corals too. With a complete absence of current and being able to see the bottom, this dive site felt very different from most of the others we’d seen in Palau. I have to say that Palau absolutely blew my mind. I’ve dived a fair bit in Asia and it terms of its sheer epic scale – the size of the walls and the clarity of the viz is just spectacular – and the abundance of big and small stuff to see, it’s hard to beat. I’ll definitely be going back – next time for a week. 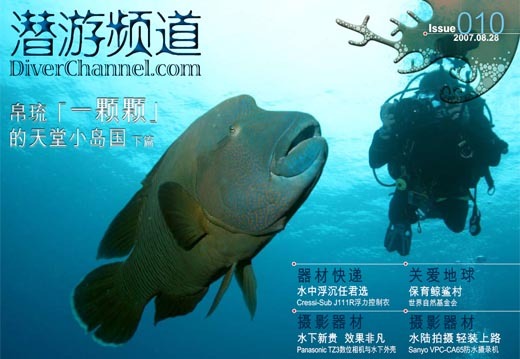 Looking at the cover of the latest issue of Chinese dive magazine DiverChannel, I suddenly realised that the fin of the featured diver looked very familiar. It was me! This was taken by Mike, one of the co-editors of DiverChannel, who was on the same scuba diving trip to Palau as me back in June. Mike and his other editor Alfred are great guys but we haven’t been in touch since the liveaboard – so it was a real surprise to see this! 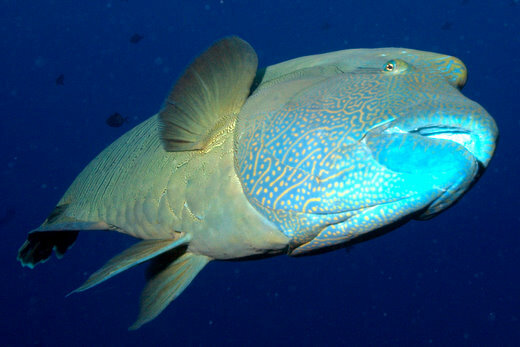 You can see my own photo of this friendly Napoleon wrasse in Part One of my Palau write up.